I received an email from a student in Singapore regarding the margin for Spread trading and where to find it. Spread trading is gaining more popularity, even internationally based on the emails I have been receiving. Let’s now look at two different Futures Exchanges and identify the process of figuring out how much Margin (capital) is required to trade these things called Spreads. Spread trading involves the simultaneous purchase of one month and simultaneous sale of another month of the same Commodity to be an Intra-Commodity Spread. To simultaneously purchase and sell related Commodities is known as an Inter-Commodity Spread. The Intra-Commodity Spread is the least volatile and risky of the two. Notice I said “least” not “risk free”. All investments have some degree of risk associated to them. Because of this less risk and volatility they require the least amount of Margin to trade. Spread trading is almost like being a Commercial in the markets. You are actually hedging your risk by being both long and short simultaneously of the same market. The Spread makes money when one month out performs the other based on the supply/demand of that Futures market (not technical levels of supply/demand). The Inter-Commodity Spreads require the simultaneous purchase and sale of related markets. For example Lean Hogs/Live Cattle, Corn/Soybeans, Japanese Yen/British Pound, 10 Year Treasury/ 30 Year Bond, etc. Because they are just related and not the same market these Spreads can actually have both the long and short go against your position at times, making them more risky. The intra-day range on these Spreads tend to be wider too creating more volatility. We will review the Soybean market that trades on the CMEGroup Exchange and the Cocoa market that trades on the ICE. To trade an outright Futures contract (either long or short) the margin for Cocoa would be Initial Margin of $935 and Maintenance of $850. To trade a Spread of the Cocoa market you would have reduced Margin. Figure 1 will illustrate what a Margin page for Spreads looks like on ICE for Cocoa. 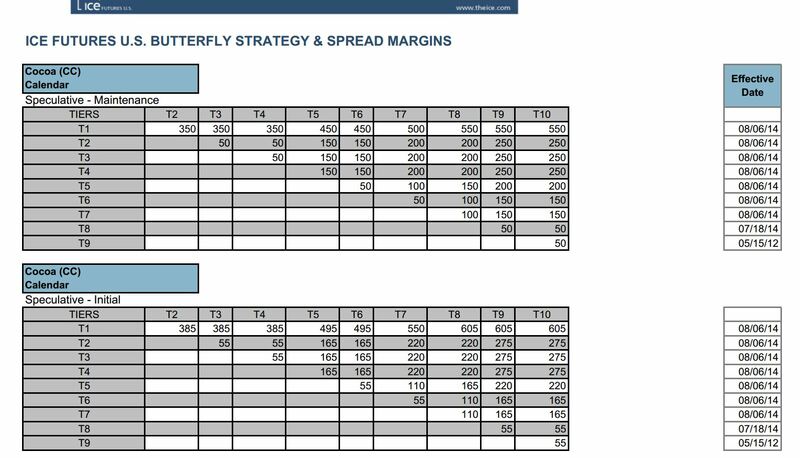 There are Spreads known as Butterfly’s that have 3 or more legs (longs and shorts), but we will focus on the calendar Spreads of just two legs. Looking at the table we can see that if a trader were to Spread December 14 (Tier 1) with March 15 (Tier 2) the required Margin would be $385 Initial and $350 Maintenance.Tier 1 will be the front month contract and the other Tiers will be the months in the contract cycles after Tier 1. If they chose to Spread a further out month then May 15 (Tier 3) and July 15 (Tier 4) the required Margin would be $55 initial Margin and $50 maintenance Margin. To trade an outright Soybean Futures contract on the CMEGroup would be $3,300 initial Margin and $3,000 maintenance Margin. The Spread margin for Soybeans will be reduced as well due to the lower volatility and risk of a Spread position. Figure 2 shows the Margin for a Spread trade of Soybeans on the CMEGroup. The CMEGroup website is a little more trouble navigating to get your Margin requirements for both outright and Spread positions. Initially on the homepage you scroll down to the list of markets traded on the CMEGroup. There you would click on the link of the product you are interested in finding the Spread Margin. Once on the quotes page look at the menu above the quotes and find Margins. Then click on “Intras” tab. At this point Fig 2 will appear on your browser page. Each column of this page represents the Spread we are interested in trading. Start Period & End Period = You will look for the expiration months you are trading in the Spread here. This is not the current calendar month of the year, but expiration months. Maintenance Margin = Amount of capital required to be in a trader’s account while the position is open. This is where the CMEGroup needs to bring back the Initial Margin column from the list. Hopefully one day they will return to publishing both of these crucial numbers, plan on Initial Margin being a little more than Maintenance Margin. As you read Figure 2 the Margin to trade a Soybean Spread would be $1,100 Maintenance if your Spread months you were trading fell between September 2014 and November 2017. To find the correct Margin you must make sure the line you are referencing has both the Start and End dates listed, otherwise you don’t know exactly which expiration months they are referring to. If you are trading with a broker who trades Spreads their firm will have up to date Margin requirements on their website and you can also contact your broker directly for this current information. How to Hedge Calender spreads?